Prior to forming All Elite Wrestling with Tony Khan and Cody Rhodes, Matt and Nick Jackson- collectively known as The Young Bucks- were reportedly in talks with WWE, who apparently offered them a big money contract. In the latest edition of The Observer, Dave Meltzer revealed the plans WWE seemingly had in store for Matt and Nick Jackson, along with the rest of The Elite. On 1st January 2019, former Bullet Club members Cody Rhodes and The Young Bucks officially unveiled their own wrestling promotion, All Elite Wrestling, as the Elite trio announced their partnership with Tony Khan and the rest of The Khan Family. Within the next few weeks, AEW would officially unveil their first batch of signings, as the likes of Chris Jericho, Britt Baker, Kylie Rae, SCU, and Kenny Omega were all announced as official AEW signings. During a recent edition of The Observer, respected Wrestling Journalist Dave Meltzer reported that WWE seemingly had big plans for The Young Bucks after having initially offered them a contract which would've seen them earn the same amount of money as AJ Styles. WWE reportedly also pitched an invasion angle with members of The Elite, involving the likes of Kenny Omega, Cody Rhodes, Hangman Page, and obviously The Young Bucks as well. Furthermore, it was noted that The Young Bucks would've seemingly been allowed to leave if they were unhappy with their direction three months into their deal. 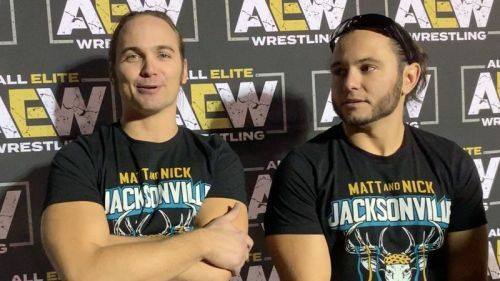 The Young Bucks, alongside the rest of The Elite, are currently preparing for AEW's first ever show which has been billed as Double or Nothing. The show takes place on the 25th of May at the MGM Grand Arena in Las Vegas, Nevada. So far, the card features the likes of Kenny Omega, Chris Jericho, The Bucks, Lucha Bros, Kylie Rae, and several other notable names. Follow Sportskeeda for all the updates on WWE news, WWE rumors, WWE Raw, SmackDown, Live Event results and PPV Schedules.